I seriously do not have any idea why this picture is blurry! They look perfect when I am resizing it on my computer, but when I publish it here it looks like crap! I am so sorry! This is a card I really wanted to show to my downline at our Technique class the other night, but I couldn't find it! I found it the next day in a side pouch of my stamp bag! So here it is, made with the large solid petal from "Pick a Petal"! 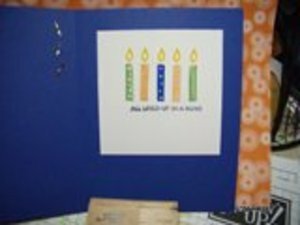 It is a really quick and super-fun card to make, it has been a hit at alot of parties this past month. 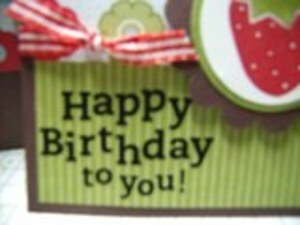 If you would like to make this card, just contact me and we can make it at YOUR party! 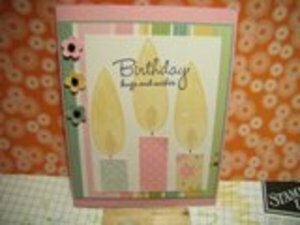 We used "Spring Fling" paper to make this card, along with the Three For You flower punch! Once again, a blurry image! I am so frustrated by this. My early posts are not blurry, taken with the same camera, edited the same way on the same computer with the same program, WHAT AM I DOING WRONG?! If anyone has a clue, please let me know! This is another color version of the same card, but with a more masculine feel. The colors in this paper, Jersey Shore, are Pumpkin Pie, Brilliant Blue, and Wild Wasabi! I used Summer Sun for the Petal "flames". This is the inside of the Jersey Shore card. For the inner greeting I used "all lined up in a row" from the Older & Wiser Level 3 Hostess Set. EXCLUSIVE Tart & Tangy Class! Why do I want to take this class, you ask? I am only offering this class on these two dates and this project will ONLY be taught at this class! This is a super-adorable cute project! I had a blast creating it! 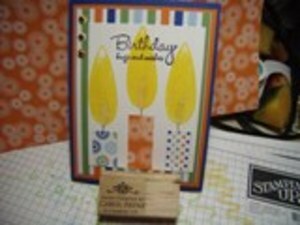 The cost of the class is the exact cost of ordering, including shipping and tax, these 3 Occasions mini items, so the instructions, additional supplies, and stamping fun are free! 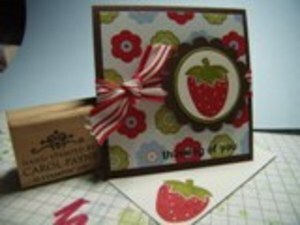 At this class you will make this adorable box and four 3x3 notecards with envelopes! For the $40 fee, I will pre-order the stamp set, Designer paper, and rub-ons. 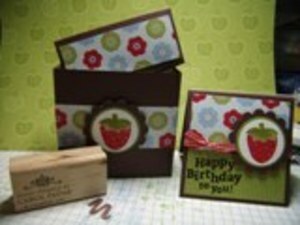 Everything will be ready for you when you arrive to make this box and 4 cards! 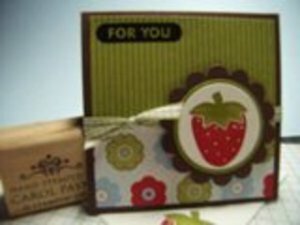 At the end of the class the stamp set, Designer Paper pack, and the Rub-ons are your's to take home and make additional projects! 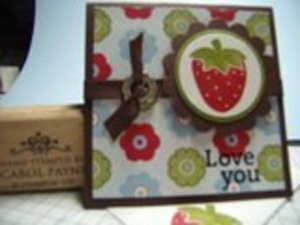 I will provide everything else you need for this class: pre-cut & scored box pieces and cards, ribbon, SNAIL, punches, even a new Styled Silver Hodgepodge Hardware "ribbon slide" will be included in your packet! Full instructions and dimensions to re-create this box will be included with the class! You MUST RSVP and pre-pay for this class no later than Saturday, March 15, 2008! I have to place the order for the stamps, etc, for this class on this date in order to have the supplies in time to prepare for the class. Please let me know which night you are registering for when you RSVP. Call me at 618-237-6281 or email me at care_olpain@hotmail.com. I accept cash, checks, or major credit cards, so pre-pay should not be a problem! For those of you who may be unable to attend my class on March 24 or 25, DON'T DESPAIR! You can order the class/kit for the same price, plus additional shipping (if you are unable to pick up the kit from my house or at a future event)! 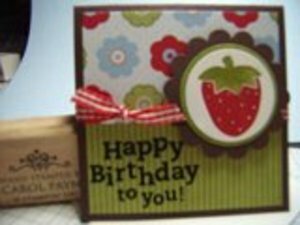 For $40 plus additional Priority shipping (I will take the kit to the PO to find the shipping price) you will receive the same 3 Occasions mini items, plus the pre-cut and scored cardstock, pre-punched embellishments & ribbon. You will also receive detailed instructions of how to assemble the box. If you need to purchase the inks used (we will be using Old Olive and Real Red Stampin' Write markers), you can add that to your kit for an additional $7.63!